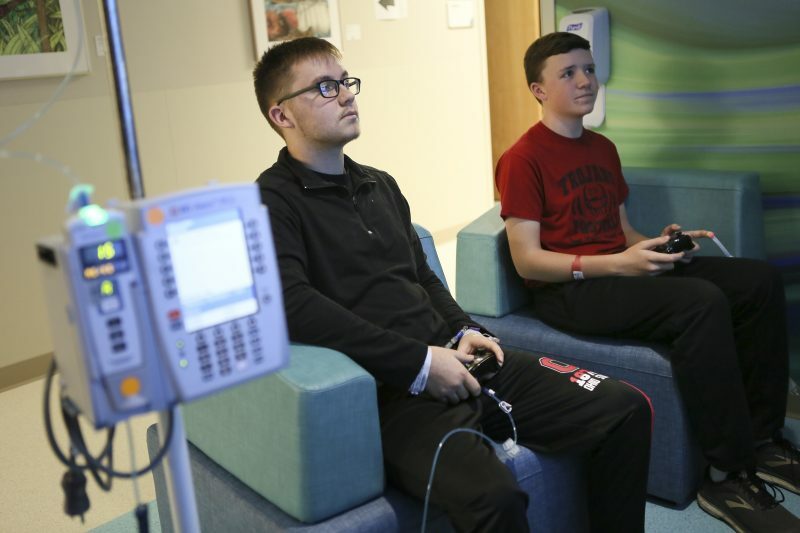 Colton plays video games as he gets an infusion in the new center for outpatients. 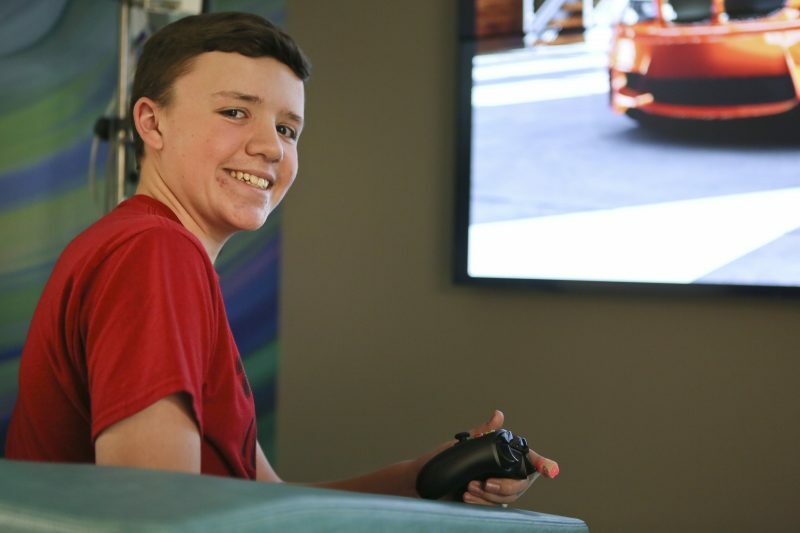 During a recent visit in our new Infusion and Sedation Center, 13-year-old Colton settled in front of a large video wall to play a car racing game. For kids like Colton, video games are a welcome distraction while they’re receiving infusions, which usually take several hours to complete. The new play zone, which features the video wall, is just one of many amenities incorporated into the design of the Infusion and Sedation Center to enhance patient experience. The Xbox consoles and video wall were donated by Extra Life, an organization that unites gamers around the world in support of their local Children’s Miracle Network Hospital. Patients can play video games in their rooms or with each other in a common area with a big video wall in the new Infusion and Sedation Center. The new Infusion and Sedation Center opened in October on the first floor of the main hospital building on our Akron campus. For the first time, our sedation service has dedicated space. Dr. Troy Sands serves as director of Pediatric Sedation Services, while Dr. Corrie Stofcho is the director of Pediatric Infusion Services. The center’s close proximity to our Radiology Department is also ideal for patients who need sedation before imaging procedures. At Akron Children’s, 60% of our sedations are for radiology procedures, especially for young children up to age 5-7 years who can’t stay still during their procedure. The other 40% are for invasive and painful procedures, such as spinal taps, bone marrow aspirations, dental procedures, or removal of sutures or stitches. Sedation may also be used with brainstem-evoked response hearing tests in children who are very young and developmentally or behaviorally unable to complete other hearing tests. The Infusion and Sedation Center features 2 large procedure rooms that can easily accommodate our sedation and procedure teams, as well as one parent. After the test or procedure, patients are moved to a nearby recovery room for a short stay before discharge. Infusions are used to treat a wide range of medical conditions, as well as provide antibiotic therapy, blood product transfusions, or intravenous steroids or fluids. Our hematology-oncology patients continue to receive chemotherapy and infusion services in the Showers Family Center for Childhood Cancer and Blood Disorders, except for a type of chemotherapy that’s administered through a spinal tap under sedation. Patients who receive infusions for headaches are still treated in the Headache Infusion Center in our NeuroDevelopmental Science Center. While infusions and sedations are 2 distinct services, combining them into one location has proven to be an efficient and effective use of the space. The treatment rooms can flex back and forth to accommodate each service during their respective busy times. There are also two other large infusion rooms with private bathrooms. 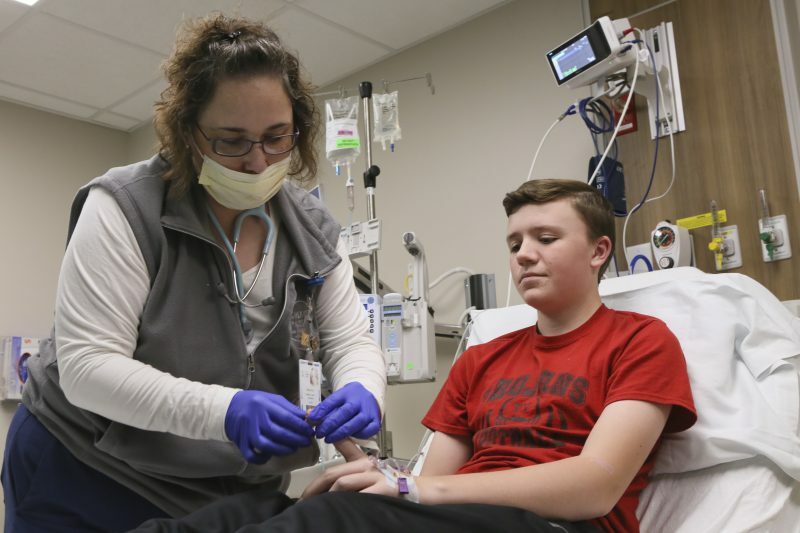 To accommodate infusion patients after hours, the center is open until 8 p.m. A covered driveway for convenient patient pickup and drop-off is located on Locust Street. Families may park in the Bowery Street Parking Deck or use the valet service on Locust Street. During their stay, infusion patients may order a meal tray, or get snacks and drinks from the center’s nutrition station. After recovering from sedation, patients are offered a light snack and drink before they go home.